Free download Butterfly on Desktop latest version. There are a lot of utilities which can be applied on your computer desktop using Windows Operating System. Some utilities reduce your tension or worry while others are helping you to tell about your system performance. There are also some utilities those provide you entertainment and cause some recreation for you. 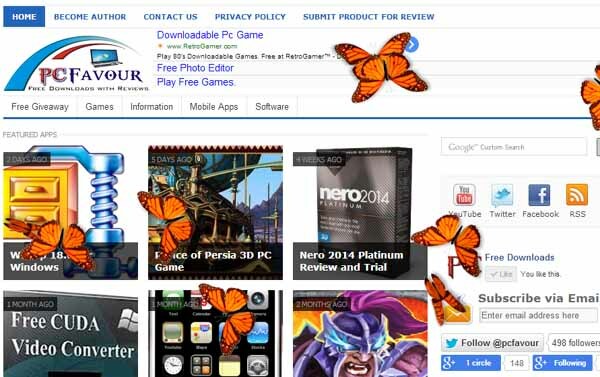 Butterfly on Desktop is one of the utility which provide a natural touch to your desktop. Butterfly on Desktop is in the form of application. You can run it if you are free, doing some work outside your PC or leave your computer system for some time. Butterfly on Desktop is free software and very light weight. Firstly, download this application software through Download Now button. Downloading and installation is totally free. This is the setup file for this application. Installation of Butterfly on Desktop application is very simple and easy. It will take less than a minute to install on your personal computer or laptop. When the installation process will complete and you will exit the setup, this application will launch by default. Now you can see some butterfly on your desktop. These butterflies will show not only on your desktop but also will flutter around even if you open any application or program such as MS Office application or any web browser such as Google Chrome or Mozilla Firefox. After launching the application, you can see it on your taskbar with the icon of butterfly. If you want to manage this application, you have to make a right click on icon from taskbar. There are six options in this program. From settings option, you can manage some basic functionality of this application. For example, you can enable or disable “Always on top” function or allow or disallow it to load on startup. You can also define the number of butterflies at start. By default, it will launch two butterflies when you start this application.